Former Central Intelligence Agency Director Mike Pompeo has recently completed his first trip to the Middle East as U.S. Secretary of State. Perhaps not surprisingly as President Donald Trump appears prepared to decertify the Joint Comprehensive Plan of Action (JCPOA) limiting Iran’s nuclear program creating a possible casus belli, much of what Pompeo said was focused on what was alleged to be the growing regional threat posed by Iran both in conventional terms and due to its claimed desire to develop a nuclear weapon. One hopes that discussions between Pompeo and his foreign interlocutors were more substantive than his somewhat laconic published comments. But given the comments themselves, it is depressing to consider that he was until recently Director of the CIA and was considered an intellectually brilliant congressman who graduated first in his class at West Point. One would hope to find him better informed. Very little that surfaced in the admittedly whirlwind tour of the Middle East is fact-based. Starting with depicting Iran as a regional and even global threat, one can challenge the view that its moves in Yemen and Syria constitute any fundamental change in the balance of power in the region. Iranian support of Syria actually restores the balance by returning to the status quo ante where Syria had a united and stable government before the United States and others decided to intervene. Israeli claims repeated by Washington that Iran is somehow building a “land bridge” to link it to the Mediterranean Sea are wildly overstated as they imply that somehow Iraq, Syria, and Lebanon are willing to cede their sovereignty to an ally, an unlikely prospect to put it mildly. Likewise, the claim that Iran is seeking to “dominate the region” rings hollow as it does not have the wherewithal to do so either financially or militarily and many of its government’s actions are largely defensive in nature. The reality is that Israel and Saudi Arabia are the ones seeking regional dominance and are threatened because a locally powerful Iran is in their way. Israel and Saudi Arabia are the ones seeking regional dominance and are threatened because a locally powerful Iran is in their way. Support by Tehran for Yemen’s Houthis is more fantasized than real with little actual evidence that Iran has been able to provide anything substantial in the way of arms. The Saudi massacre of 10,000 mostly Yemeni civilians and displacement of 3 million more being carried out from the air has been universally condemned with the sole exceptions of the U.S. and Israel, which seem to share with Riyadh a unique interpretation of developments in that long-suffering land. The U.S. has supplied the Saudis with weapons and intelligence to make their bombing attacks more effective, i.e. lethal. Pompeo did not exactly endorse the ludicrous Israeli claim made by Benjamin Netanyahu last week that Iran has a secret weapons of mass destruction program currently in place, but he did come down against the JCPOA, echoing Trump in calling it a terrible agreement that will guarantee an Iranian nuclear weapon. The reality is quite different, with the pact basically eliminating a possible Iranian nuke for the foreseeable future through degradation of the country’s nuclear research, reduction of its existing nuclear stocks and repeated intrusive inspections. Israel meanwhile has a secret nuclear arsenal and is a non-signatory of the Nuclear Non-Proliferation Treaty without any demur from the White House. The Israeli-Pompeo construct assumes that Iran is singularly untrustworthy, an odd assertion coming from either Washington, Riyadh or Tel Aviv. It also basically rejects any kind of agreement with the Mullahs and is a path to war. It is interesting to note that the Pentagon together with all of America’s closest allies believe that the JCPOA should stay in place. And then there is the claim that Iran is the world’s greatest sponsor of terrorism. In reality that honor belongs to the United States and Israel with Iran often being the victim, most notably with the assassination of its scientists and technicians by Mossad agents. Israel has also been targeting and bombing Iranians in Syria, as has the United States, even though neither is at war with Iran and the Iranian militias in the country are cooperating with the Syrians and Russians to fight terrorist groups including ISIS as well as those affiliated with al-Qaeda. The U.S. is actually empowering terrorists in Syria and along the Iraqi border while killing hundreds of thousands in its never-ending war on terror. Israel meanwhile has agreements with several extremist groups so they will not attack its occupied Golan Heights and also seeks to continue to destabilize the Syrians. There is the claim that Iran is the world’s greatest sponsor of terrorism. In reality that honor belongs to the United States and Israel with Iran often being the victim, most notably with the assassination of its scientists and technicians by Mossad agents. 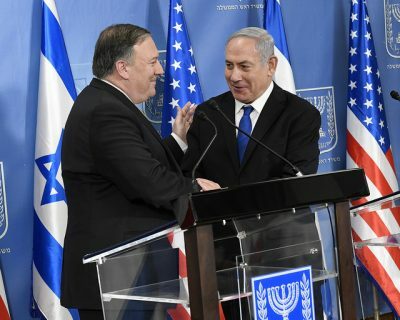 Pompeo also endorsed Israel’s “fight” against the Gazan demonstrators and pledged that America would stand beside its best friend. As of this point, Israel has used trained army snipers to kill forty-three unarmed protesting Palestinians. Another 5,000 have been injured, mostly by gunfire. No “threatened” Israelis have suffered so much as a broken fingernail and the border fence is both intact and has never been breached. Israel is committing what is very clearly a war crime and the United States Secretary of State is endorsing the slaughter of a defenseless people who are imprisoned in the world’s largest open-air concentration camp. Donald Trump entered into office with great expectations, but if Mike Pompeo is truly outlining American foreign policy, then I and many other citizens don’t get it and we most definitely don’t want it.